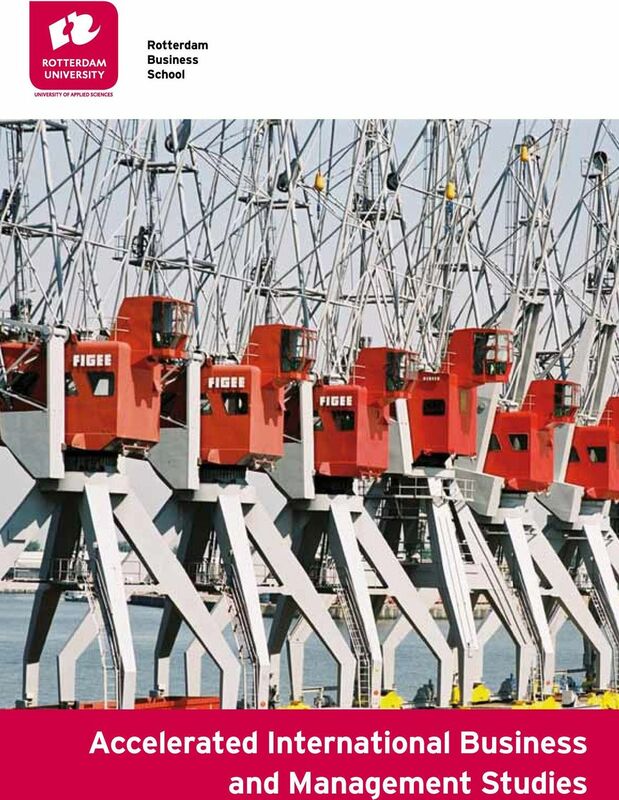 Download "Accelerated International Business and Management Studies"
2 Rotterdam Business School The Rotterdam Business School is the international school of the Rotterdam University, University of Applied Sciences. When Rotterdam Business School was founded many new programmes were developed to meet the demands expressed by both students and the international business community. Innovation has always been the driving force behind the school s growth. The possibilities for international exchanges and industrial placements are constantly being expanded, while the school also welcomes more and more students from all over the world. The international experience that students gain, both in their studies and in the social environment, gives them a head start that will be reflected in their success when applying for jobs worldwide. 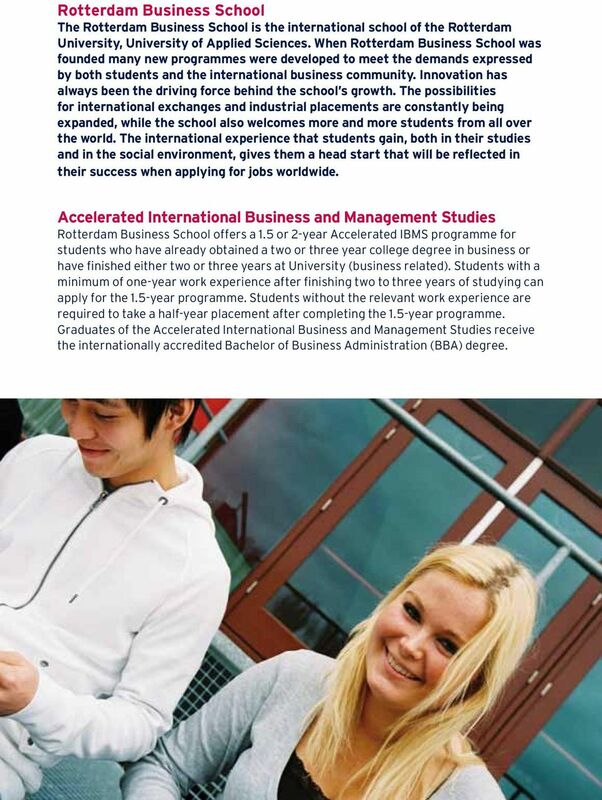 Accelerated International Business and Management Studies Rotterdam Business School offers a 1.5 or 2-year Accelerated IBMS programme for students who have already obtained a two or three year college degree in business or have finished either two or three years at University (business related). Students with a minimum of one-year work experience after finishing two to three years of studying can apply for the 1.5-year programme. Students without the relevant work experience are required to take a half-year placement after completing the 1.5-year programme. Graduates of the Accelerated International Business and Management Studies receive the internationally accredited Bachelor of Business Administration (BBA) degree. 3 Programme The Accelerated International Business and Management Studies programme consists of three or four semesters: 2 semesters of study, one semester writing a thesis and, depending on the student s work experience, an internship for one semester. The Accelerated programme starts in February. During the study semesters the following modules will be offered: Repetition modules of the first and second year IBMS to enrich the student s general knowledge. Business Communication. Research Modules Core Modules of semester 6 and 7 of the IBMS programme. 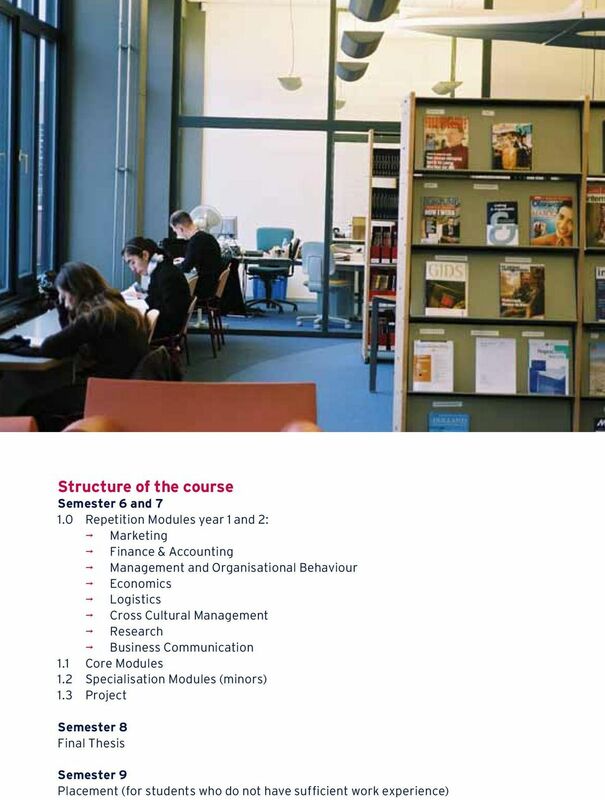 Specialisation modules (minors) of semesters 6 and 7 of the IBMS programme: Logistics Management, or Marketing Management, or Finance and Accounting Personal Development Plan The Personal Development Plan (PDP) In the Personal Development Programme the students develop their individual portfolios, which aim to reflect the students development and the competencies gained during the course of the programme. The first step is to draft a Personal Development Plan defining the students goals and needs. Every achievement during the study programme is added to the portfolio. At regular intervals the student discusses his/her progress with a personal coach. 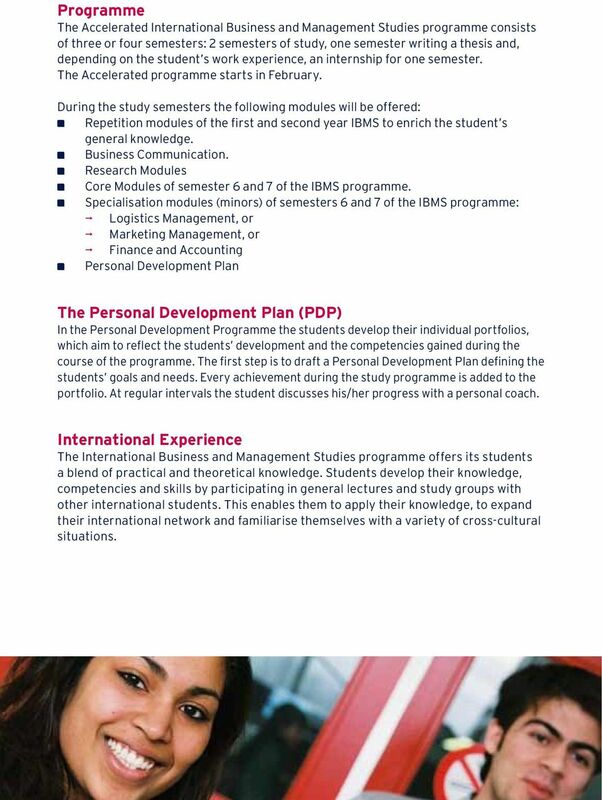 International Experience The International Business and Management Studies programme offers its students a blend of practical and theoretical knowledge. Students develop their knowledge, competencies and skills by participating in general lectures and study groups with other international students. This enables them to apply their knowledge, to expand their international network and familiarise themselves with a variety of cross-cultural situations. 5 Admission Requirements 2-3 years university education/business major or college degree in business IELTS 6.0/TOEFL ibt 80 1 year relevant work experience (for the 1 1 /2-year programme) Entrance examination in business subjects at RBS Intake interview IELTS Requirement In order to attract a high level of students Rotterdam Business School requires that students can only have one 5.5 on the sub-scores, all other scores need to be 6.0 or higher. Tuition Fees Semester 6 (first half year): 3,750.-* Semester 7/8: 5,500.-* Placement fee * Prices of the tuition fee may be subject to change over the coming years. 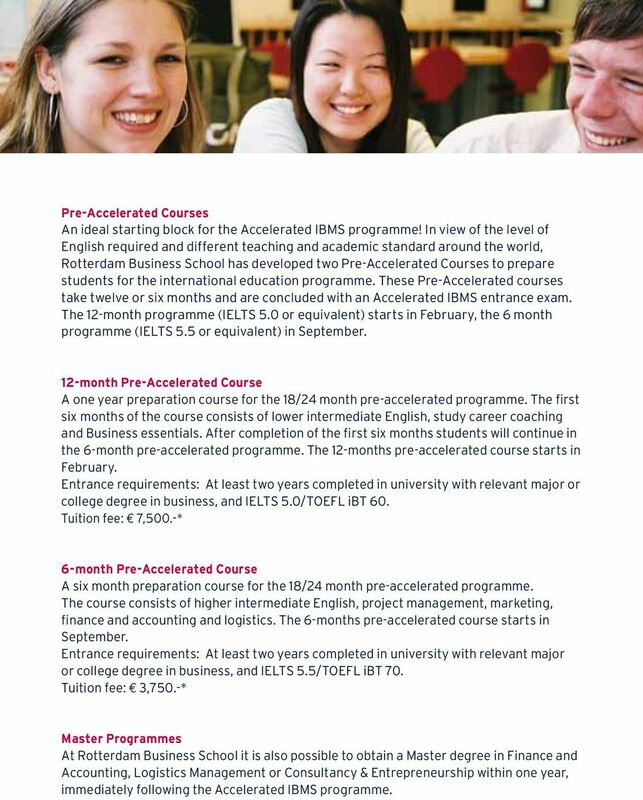 6 Pre-Accelerated Courses An ideal starting block for the Accelerated IBMS programme! In view of the level of English required and different teaching and academic standard around the world, Rotterdam Business School has developed two Pre-Accelerated Courses to prepare students for the international education programme. These Pre-Accelerated courses take twelve or six months and are concluded with an Accelerated IBMS entrance exam. The 12-month programme (IELTS 5.0 or equivalent) starts in February, the 6 month programme (IELTS 5.5 or equivalent) in September. 12-month Pre-Accelerated Course A one year preparation course for the 18/24 month pre-accelerated programme. The first six months of the course consists of lower intermediate English, study career coaching and Business essentials. After completion of the first six months students will continue in the 6-month pre-accelerated programme. The 12-months pre-accelerated course starts in February. Entrance requirements: At least two years completed in university with relevant major or college degree in business, and IELTS 5.0/TOEFL ibt 60. Tuition fee: 7,500.-* 6-month Pre-Accelerated Course A six month preparation course for the 18/24 month pre-accelerated programme. The course consists of higher intermediate English, project management, marketing, finance and accounting and logistics. The 6-months pre-accelerated course starts in September. Entrance requirements: At least two years completed in university with relevant major or college degree in business, and IELTS 5.5/TOEFL ibt 70. 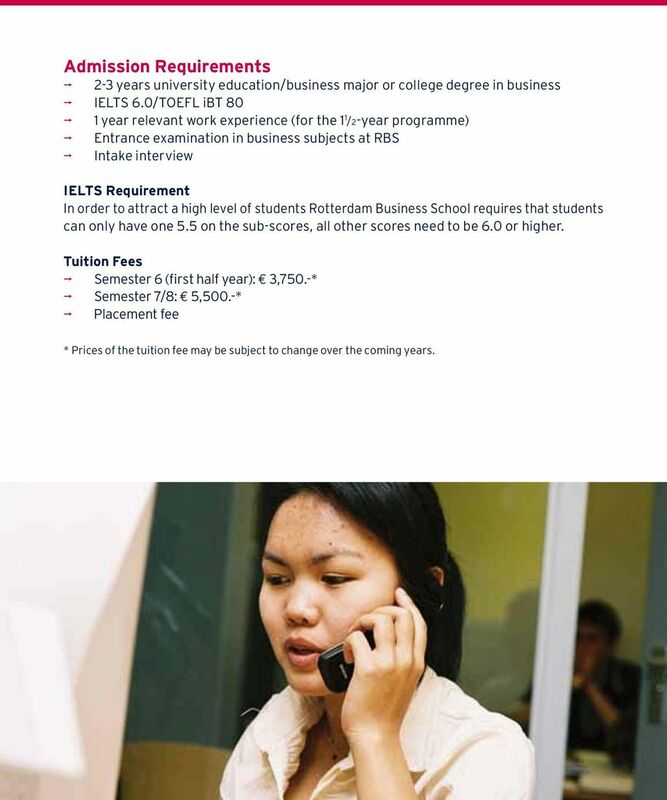 Tuition fee: 3,750.-* Master Programmes At Rotterdam Business School it is also possible to obtain a Master degree in Finance and Accounting, Logistics Management or Consultancy & Entrepreneurship within one year, immediately following the Accelerated IBMS programme. 7 Application Procedure The following steps are essential for the application procedure: Submit an application form with (certified) copies and English translations of your college degree(s), grades list(s), birth certificate and a copy of your passport, plus five passport photos and your score of the English test. Students from China are required to obtain the NESO Certificate. 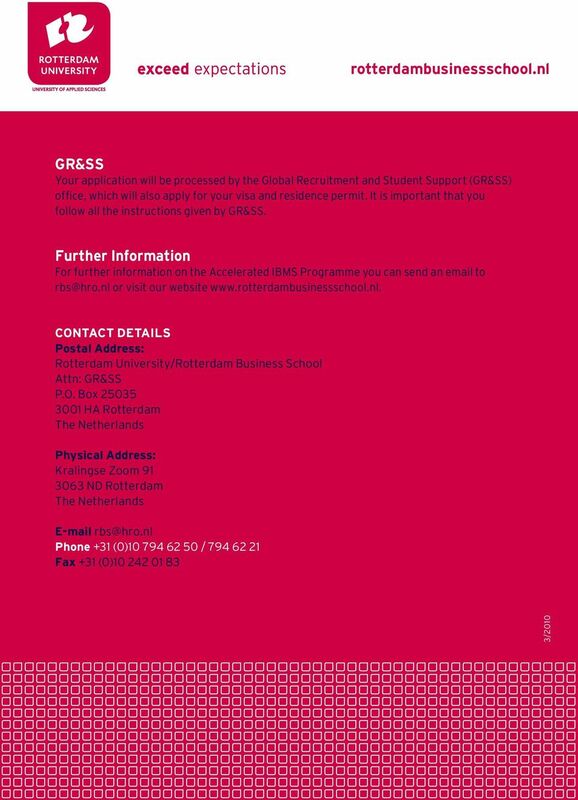 Information about this can be obtained from Rotterdam Business School will acknowledge receipt of the application form and inform you of the details of your intake interview and business test. Whenever possible, the intake interview and business test will take place in your country of origin (either in person or by telephone/skype). 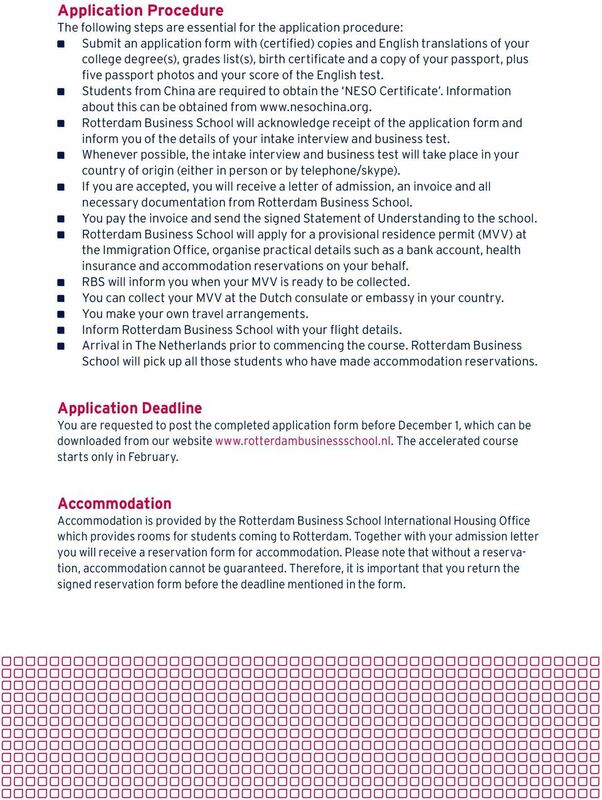 If you are accepted, you will receive a letter of admission, an invoice and all necessary documentation from Rotterdam Business School. You pay the invoice and send the signed Statement of Understanding to the school. Rotterdam Business School will apply for a provisional residence permit (MVV) at the Immigration Office, organise practical details such as a bank account, health insurance and accommodation reservations on your behalf. RBS will inform you when your MVV is ready to be collected. You can collect your MVV at the Dutch consulate or embassy in your country. You make your own travel arrangements. Inform Rotterdam Business School with your flight details. Arrival in The Netherlands prior to commencing the course. Rotterdam Business School will pick up all those students who have made accommodation reservations. Application Deadline You are requested to post the completed application form before December 1, which can be downloaded from our website The accelerated course starts only in February. Accommodation Accommodation is provided by the Rotterdam Business School International Housing Office which provides rooms for students coming to Rotterdam. Together with your admission letter you will receive a reservation form for accommodation. Please note that without a reservation, accommodation cannot be guaranteed. Therefore, it is important that you return the signed reservation form before the deadline mentioned in the form. Pre-Bachelor International Business and Management Studies Rotterdam Business School The Rotterdam Business School is the international school of the Rotterdam University, University of Applied Sciences. INTERNATIONAL BUSINESS AND LANGUAGES NEW APPLICATION DEADLINE 15 MARCH! Study in Germany. Pathway programs to access German universities offer new alternatives to your portfolio. We will explain the necessary steps..
Master of Theology (in depth) Protestant Theological University About the PThU The Protestant Theological University (PThU) is a specialized university for the theological study of the Christian Faith.